The action thriller makes good use of Dwayne "The Rock" Johnson in a plot that throws in more and more and more. Rating: 2 stars out of 4. This would be enough plot for most movies, right? Ah, you are perhaps not familiar with this particular genre, which most recently saw Johnson saving the world from enormous genetically mutated animals headed inexplicably to Chicago in “Rampage.” Alas, they don’t show up in “Skyscraper”; more’s the pity. But writer/director Rawson Marshall Thurber throws in nearly everything else, giving Will an artificial limb, a kid with bad asthma, a Spider-Man-like talent for climbing 100-story cranes (and then, once at the top, the ability to actually operate the crane; did he learn this in FBI school? ), a knack for fixing horrific-looking injuries with duct tape and vodka, and … well, he can fly. Just look at the “Skyscraper” poster if you don’t believe me. Where most people would plummet, blubbering wimpily all the way down, Will bravely soars, like a capeless superhero. Gravity works differently with him, apparently. It’s a tribute to Johnson that I didn’t doubt any of this for one second; frankly, I’m wondering why he hasn’t joined the Avengers universe, as he would sort out their current troubles right quick. “Skyscraper,” which lacks the lunkheaded charm of “Rampage,” isn’t the ideal vehicle — its special effects are murky (I saw it in 2D; it’s probably even muddier in 3D), and a bit of wit wouldn’t have been unwelcome. 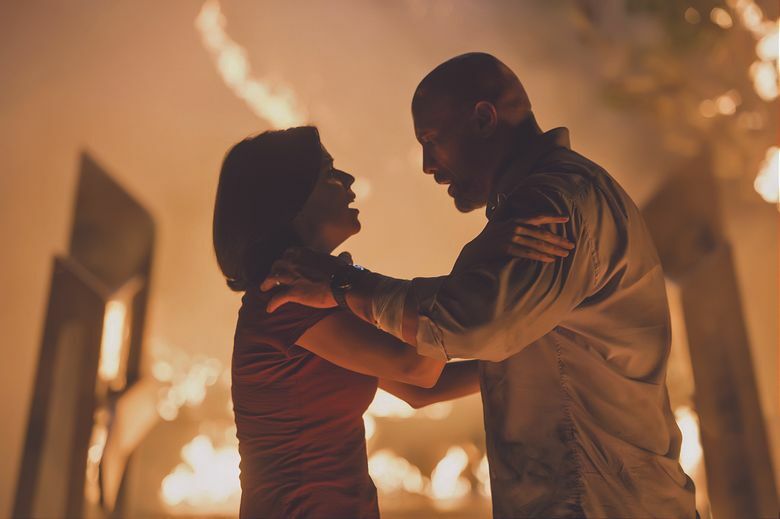 Nobody in this film has a personality; they’re just evil, stoic, mildly badass (particularly Neve Campbell, as Will’s resourceful wife) or The Rock. Luckily, he’s got enough presence to go around. “In order to be brave, we’ve got to be a little scared,” Will tells his young son, before a particularly terrifying journey across a plank (! ), and I suspect a lot of us might have walked that plank with him; Johnson has a way of making his listeners feel that everything, somehow, is going to be OK. Though limited as an actor — “Skyscraper” makes good use of the Serious I-Got-You Nod and the Seething Wide-Eyed Glare, which make up a big chunk of his range — Johnson’s terrific as a movie star. May he continue to save the world, despite whatever impediments are thrown his way; the multiplexes need him. 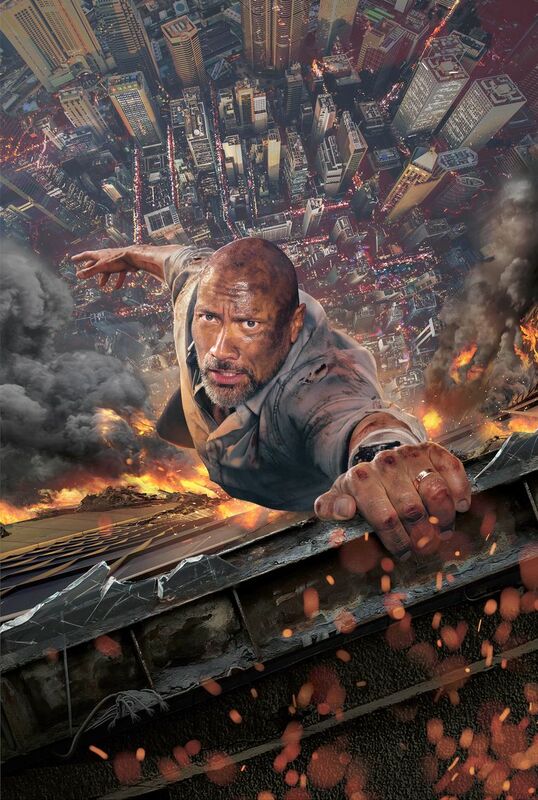 ★★ “Skyscraper,” with Dwayne Johnson, Neve Campbell, Chin Han, Roland Moller, Noah Taylor, Byron Mann, Pablo Schreiber, Hannah Quinlivan. Written and directed by Rawson Marshall Thurber. 103 minutes. Rated PG-13 for sequences of gun violence and action, and for brief strong language. Multiple theaters.